Click on figure to enlarge. 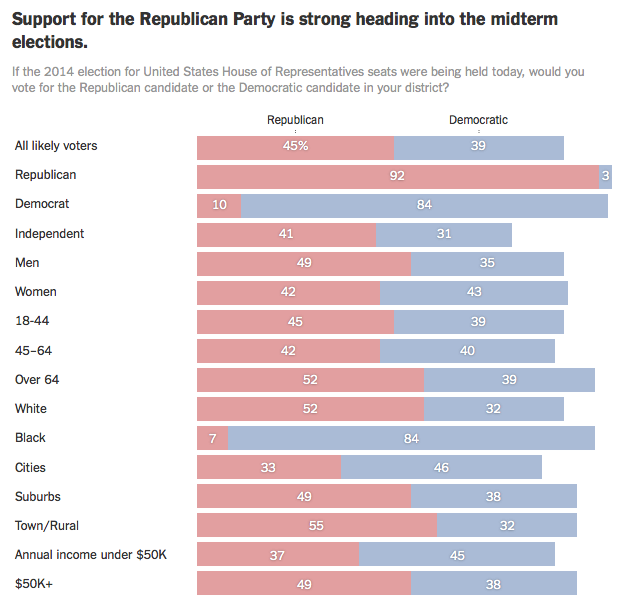 The NY Times article on their September 12-15 survey is available here. -- Right before the 2010 midterm elections Obama's approval rate was at 45 percent. Before the 2012 election it was at 50 percent. Today it is at 40 percent. -- Right before the 2010 midterm elections 34 percent thought that the country was heading in the wrong direction. Before the 2012 election it was at 39 percent. Today it is at 27 percent. -- At the 2010 midterm elections 46 percent approved of Obama's foreign policy. Before the 2012 election it was at 47 percent. Today it is at 34 percent. -- Right before the 2010 midterm elections 42 percent approved of Obama's economic policy. Before the 2012 election it was at 46 percent. Today it is at 40 percent. -- Before the 2010 midterm elections 51 percent approved of Obama's terrorism policy. Today it is at 41 percent. -- Today 30 percent approve of how Obama is handling immigration. If this election is viewed as a referendum on Obama's policies, Democrats have reasons to be concerned.